Faraway Pillow: Eat, Eat, Eat, Eat! Much to my amusement, my toddler has learned the words ‘eat’ and ‘airplane’ this week. Instead of crying when he is hungry my adorable young son says ‘eat, eat, eat, eat’ like a broken record until he gets his food. He also points enthusiastically at the sky each time an airplane passes overhead and says ‘airplane’, though it sounds a lot like a drunken foreigner with a strong accent pronouncing it a lot like the word ‘open’. With baby on the brain I thought it only appropriate to tie the two concepts together- airplane food. Let’s agree, one of the worst things about flying is the food. You’ve just been pushed, shoved, and herded around like cattle to finally get into a pressurized metal tube that will blast through the skies at 35 thousand feet for hours on end. After all that, you’re getting served what often smells like SpaghettiO’s and looks like vomit. For better or worse, airplane food represents an airline, reflects a country’s culinary traditions and preferences, and also offers an in-flight activity…eating. Airline meals vary widely across airline companies and classes of travel. I’ve never flown first-class. I admit I prefer to save the extra money for additional trips rather than paying for the superficial comforts of a champagne welcome, fully reclining seats, personal armchair DVD players with countless film choices, fluffy slippers, superior service, and the seven-course ‘gourmet’ (how gourmet can pre-cooked, microwaved food really be?) meal that is served to the ‘other half’. I say superficial comforts because while the above luxuries make travel more comfortable, you’re still stuck on an airplane for 11 hours and to add insult to injury you just paid $3000 to do everything I can do when I arrive at my destination for a mere fraction of the price. Focusing on only long-haul flights (when actual meals are served...I'm not talking peanuts and pretzels here) and coach service and food quality to keep my assessment equitable, there are a few airlines that have gotten it right. In my experience, Air France, Virgin Atlantic, and All Nippon Airways know that food is a representation of their company as a whole and will strongly influence customers’ overall experience with the airline. The above three airlines have food that is indeed not only edible but nutritious and believe it or not, appetizing. 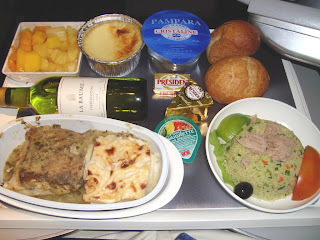 Is it any surprise that France’s national airline would serve delicious airline food? Food is paramount in France and the national airline reflects the significance of eating and drinking well. Air France manages to capture a tiny bit of the French culinary tradition. While Air France is not a Michelin starred restaurant by any stretch of the imagination, it is consistent with the French tradition of satisfying meals that consist of rich and flavorful ingredients. Paired with complimentary wine, Air France serves vegetable gratin, Normandy cheeses, Provencale-style sauté of beef with olives and tri-color pasta, filet of red mullet and green lentil salad and many other appealing choices. Moreover they serve Haagen-Dazs ice cream for dessert…yeah! Virgin America has been consistently rated number 1 for airline meals in America. 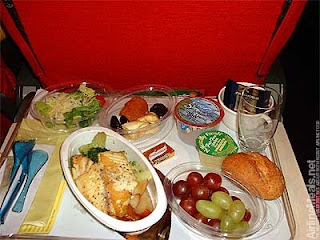 Their worldwide partner Virgin Atlantic parallels their top quality airline meals. How about a bagel with raspberry cream cheese, a tapas plate or a turkey Caprese sandwich? Relax with a champagne cocktail or a Hornitos margarita. Um, yes please! Virgin Atlantic, a British airline, does a great job of representing the diversity of the commonwealth and the tastes and preferences of the many British and non-British passengers that fly this superior airline. Virgin Atlantic offers meals such as chicken with baby leeks in a cream sauce, pepperpot beef, pasta with mornay sauce, and Paneer Lababdar with stir fried potato cauliflower and fenugreek. Not only that, but you can order all of your meals from a touch screen at your seat. Not only do the incredibly classy All Nippon flight attendants change into different, sleek uniforms for each segment of the flight, they don colorful, full-length aprons to serve meals such as Bento boxes, Miso soup with pork and vegetables, Teishoku meals (a meal set that includes rice, miso soup, a main dish, a side dish, and pickled vegetables), and noodles to passengers. 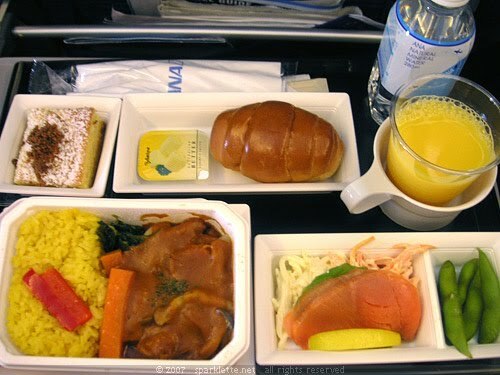 While Western meals are available, the Japanese do Japanese food best and for an American from a land-locked state, I must say the All Nippon airline food compared well with many Japanese restaurants stateside. Airline food is no doubt a manifestation of an airlines commitment to service as well as an expression of a country’s national culinary preferences. On All Nippon from Tokyo to Honolulu we were served a tasty Donburi bowl (a rice dish with simmered fish, meat and vegetables) with chopsticks. The smell of warm Mirin and soy sauce wafted through the crowded cabin. All of the Japanese passengers ate the healthy fare happily and wielded their chopsticks with ease. We made our connecting flight with a good number of the same passengers and flew United Airlines from Honolulu to Los Angeles. We were served dried-out chicken in red sauce reminiscent of jarred Prego, a ‘fake’ roll and a wilted salad with packaged Ranch dressing. The meal was disgusting but I must admit it was somewhat hilarious to watch Japanese passengers try to eat with forks. They looked like toddlers learning how to use utensils (probably what they thought when they saw me acting all cool with my chopsticks). Airline food represents an airline and national culinary traditions and preferences but it also offers an in-flight activity…eating. You’re on an 11 hour flight; you take your seat, settle in, read your trashy gossip magazine cover to cover, you sleep for what seems like hours, you go to the lavatory, you watch a bit of the in-flight movie, and then finally the meal cart begins its way down the aisle. You look at your watch and much to your chagrin you still have 9 hours left. You’ve eaten all of the snacks you brought on-board and you have exhausted all of the activities you've prepared for yourself. Now what? Eat the disgusting food in the gross foil tin because it will kill at least twenty minutes…and then you’ll only have 8 hours and 40 minutes left. Eating is an activity even if it’s not healthy or satisfying. When I fly I eat out of boredom. Whatever the meal is I get very excited when presented with the question, beef, chicken, or pasta. While I know full-well that any choice I make will result in a revolting, likely radioactive, microwaved meal full of pesky preservatives, it is still exciting to be given a distraction from zoning out into the seat back in front of me, hypnotized from complete and utter boredom.